All the machines were is use at the Albany Bottle Drop Friday afternoon. 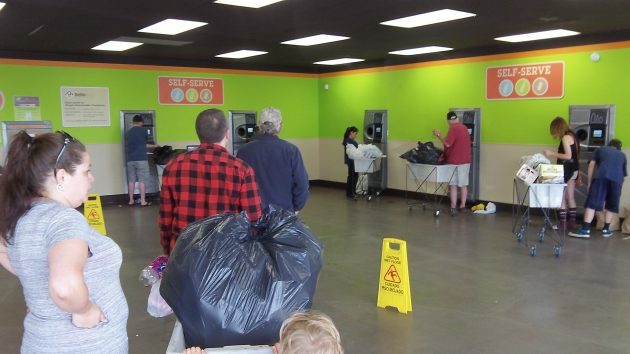 The place was busy, so there was a bit of a wait Friday for people returning their empties at the Albany redemption center run by the Oregon Beverage Recycling Cooperative. Chances are the waits will be more frequent and longer after next April, when the deposit under Oregon’s Bottle Bill doubles from a nickel to a dime. The Oregon Liquor Control Commission announced the increase Friday. It was applying a state law passed in 2011 that says the deposit must go from 5 to 10 cents if the return rate for beverage containers falls below 80 percent for two years in a row. In terms of returning bottles and cans for the deposit, we have been bad. Only 68.45 percent of containers were redeemed in 2014, and the following year the rate fell further still, to 64.45 percent. (How the state claims to know this so precisely, down to two decimal points, may be worth looking into, but not today.) Suffice it to say that as residents of Oregon, the state that pioneered mandatory deposits on beer and soft drink cans and bottles with the famous Bottle Bill in 1971, we have been found wanting. So now we’re going to pay. Well, not just yet. The OLCC says the higher deposits will take effect April 1, 2017. The likely effect then will be that more people will collect their containers until they have enough to return them, rather than putting them out with the weekly recycling and forgoing the deposit. So the crowds feeding the machines at the redemption centers most likely will grow. In Albany and several other cities, the recycling cooperative opened so-called “BottleDrop” redemption centers, which allowed retailers to quit having to mess with returns on their own. The few times I’ve visited the Albany center on Santiam Highway, it’s been pretty busy, On Friday three of four people were waiting in line with their plastic sacks full of empties. To avoid waiting or even having to go inside, some of us have chosen the option of automated returns in specially coded bags issued by the center, but that may not appeal to everyone because you don’t immediately get back any cash. Also, the site says no more than two bags a day, which means the people with pickup loads of empties would be out of luck. The two-bag-per-day limit is no good for people who have tons of empties to return. We used to give all the empties to an old guy who hung around Albertson’s. He was happy to stuff them into the machines. One trip to the new Bottle Drop was enough for me. They all go into the garbage now, just as happens in other states with no deposit. Probably not the response Salem expected. So, if I am not in a hurry to get my refund, should I just stack up my green bags and wait till next spring to turn in the bottles in, or will the new bottles be marked 10 cents thus making my old bottles still only worth 5 cents even then? Cramer and Newman already tried that. I guess I missed that episode. How did it work out? Why is there a daily limit for returns, anyway? I personally know that is a reason why people dont return for deposit. Let’s see… my time is worth at least $50 an hour, so if I have to wait 30 minutes I’d need 500 bottles to make it worthwhile. That plus the time is wasted waiting. This increase is likely to be counterproductive: I’ll likely be putting bottles in the recycle bin at home. Actually, your time is likely worth $0 until someone is willing to pay you to provide a service. So, unless you’re on the job 24/7/365 (or taking a diversion while on the clock), $0 is the comparison base. If the “I’m not gonna” reactions become prolific, I see the teen groups establishing franchises (so they don’t compete) and making regular pickups to help fund their club/team/service project needs. An even better place than the garbage or even recycling. Agreed centrist! Donate to club/team/service. 100% increase coming for can collectors. Not too shabby! Not in time for this year’s Beaver football games though. Collector heaven there despite the little bit of work effort. What does the OLCC do with the unreturned deposits? Bank it? If so, I suggest buying some paint to cover up that hideous green. Answer man, do you know? Comment on comments: if you don’t want your money back, the recycle container is a much better place than the garbage. The OLCC doesn’t get deposits. You pay the grocer, and groups of grocers now pay the cooperative to collect and deal with the empties. All I require is a 10 cent “idea” royalty. Not a deposit mind you. A royalty for each one sold or maybe just one sticker gratis. Having never been to the new Bottle Drop, I didn’t know what to expect. There was a line WAY out the door. Not having time to wait, I signed up for the bottle count service. Problem is, I had four extra large plastic bags full of cans. Only two of their little bags are allowed per day. A nice gentleman helped me empty one of my plastic bags into two of theirs. So… he got two free bags of cans, as he said he was a regular. I wasn’t going to waste my time, and gas, coming back the next two days just to return cans…. I hate bothering with cans. I usually give them to the kids in the area, but even the kids don’t want to bother with them anymore. I don’t think I would mind so much, if we could take four bags at a time. Wasting my gas, and time, to come into town for two little bags isn’t enough incentive. I do my shopping, chores, etc.. One day a week, if that. Sometimes once every two weeks. 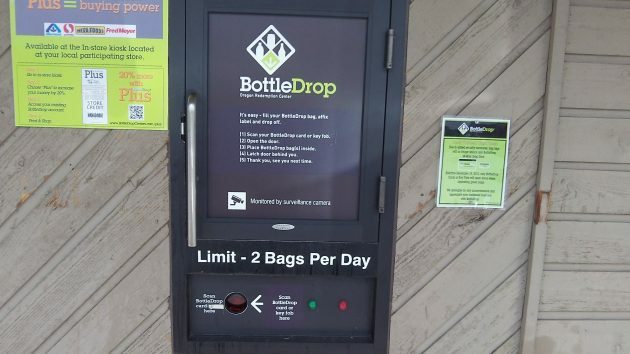 Come On Bottle Drop… It shouldn’t matter how many bags are dropped off by one person. We have to buy your bags, and are also charged a fee for you to count them. The more you count, the more you make. I understand if someone were to bring in 100 bags at once, but how often would that really happen? It really shouldn’t matter. Bottles coming in means you’re making money. Shouldn’t matter who belongs to the barcode on the bag. You’re not wasting time & gas. You’re already coming into town – you’re not making an extra trip. And you’re drinking a LOT of cans to fill up more than 2 bags each trip! I’ve noticed the lines seem to be getting longer and the employee less helpful to the point of almost hiding. What happens when TWO machines are down? I’ve already seen one down a couple times and they’re still relatively new. Understaffed. Solution: The group of grocers need to move funds into supporting these limited number of return centers. i.e. Trained Staff & Maintained Facilities. I’ve been to the bottle drop twice now. Both times there were few customers. I guess the day and time matter here. The place is cleaner than the old bottle return areas by Fred Meyer’s or Safeway. Hand washing facilities are there, which is nice. The location is ideal — it’s very close to the clumping of grocery stores in town, so it’s not an extra trip to get there. It’s no more dangerous getting into than going to Los Dos or Fred Meyer or the auto parts store. However, for folks who do not want to do this, I urge them to not throw away their cans and bottles but to save them in plastic or paper bags anyway, and give them to fund raiser folks when they knock on the door. When my girls were on the swim team at our YMCA, the team would canvas neighborhoods for cans and bottles to earn money for their swim suits, goggles, and to go to out of town swim meets. It was always a great surprise when the girls knocked on a door and instead of the few cans, or a grocery sack of cans, folks would unload multiple green garbage bags full of cans and bottles. Curbside redemption service from the sanitation provider is the way to go. They already have separate containers for trash, recycling, yard debris and glass. If one was added for “beverage containers that require a deposit”, many households would have their monthly garbage bills eliminated.